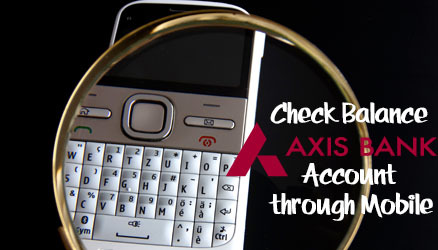 Axis Bank Accounts holders can check their account balance through mobile by various methods, so which are all those methods to check balance in Axis Bank Account through Mobile you will come to know by reading below instructions. From registered mobile number just dial 1800 419 5959 to get your Account Balance, once you disconnect the call you will receive your Axis Bank Account Balance through SMS. To get mini statement of your Axis Bank Account from your registered mobile number 1800 419 6969 and after disconnecting the call shortly you will receive mini statement of your Axis Bank Account through SMS. To get Axis Bank Account Balance in Hindi dial 1800 419 5858, once the call get disconnected you will receive available account balance through call. To get Axis Bank Mini Statement in Hindi dial 1800 419 6868, and once the call get disconnected you will receive available account balance through call. To know balance in your Axis Bank Account from your registered mobile number just compose SMS BAL [account-number] and send it to 5676782 or +919717000002, after sending the SMS in few moments you will receive a SMS containing available balance in your Axis Bank Account. To check mini statement of your Axis Bank Account from your registered mobile number just compose by typing SMS MINI [account-number] and send it to 5676782 or +919717000002, after sending SMS in few seconds you will receive a SMS containing Last 5 transactions mini statement. This is how you can easily get access to available balance in your Axis Bank Account through Mobile without any internet connection requirement.